Subtidal to 226m (740ft). This bottom dwelling fish is common along rocky shorelines and areas with large boulders which form caves or crevices. Wolf-eels are believed to mate for life and a pair will occupy the same den year after year and possibly their entire life unless they are forced out by a larger wolf-eel or a Giant Pacific Octopus. They begin pairing up at 4 years of age and reproduce at around 7 years. The female lays an egg mass within the den and it is guarded by both the male and female. The egg mass may have as many as 10,000 eggs and will hatch in around 16 weeks. The larval wolf-eels are pelagic and will drift around in the upper part of the water column for up to 2 years before settling out. Hard shelled invertebrates such as crabs, snails, sea urchin and mussels and some fish. Wolf-eels have canines and molars and unlike most fish which swallow their food whole, the wolf-eel crushes and chews with its powerful jaws. Natural Predators: Eggs and Juveniles: many fish species; Adults: harbor seals and other marine mammals. This species in not targeted by commercial or sport fisheries, possibly due to the infrequency of catching one, and populations are believed to be stable. In Puget Sound and Hood Canal recreational harvest for wolf-eels is prohibited by the Washington Department of Fish and Wildlife due to their value to divers and underwater photographers. Adult wolf-eels have a grey mottled body with darker eye-spots on their back and dorsal fin. In contrast, the juvenile wolf-eel is remarkably colorful, with spots and stripes of orange and yellow. The wolf-eel is not an eel. This is a common misnomer given its long, slender body and misleading common name. 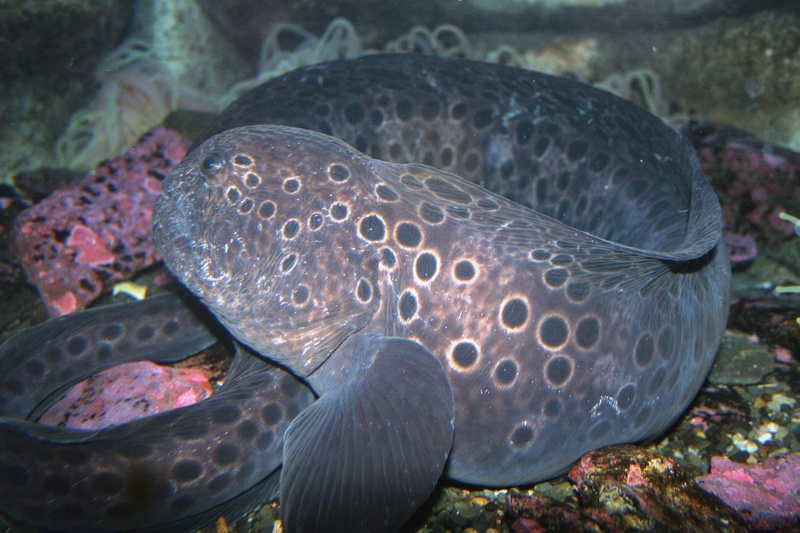 Despite their fierce appearance, wolf-eels living in areas frequented by divers can become “tamed” and regularly interact with the human visitors to their world. In native Alaskan culture only the shaman or medicine man was allowed the privilege of eating the flesh of this fish.